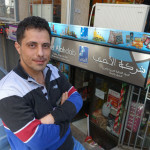 The shop is not Aksaray’s lone seller of Syrian culinary goods. 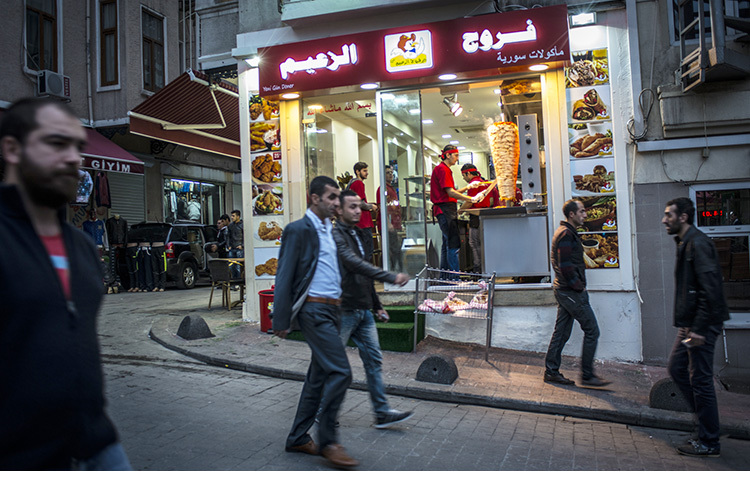 Over the last few years, as the violent conflict in Syria has driven millions of Syrians across the border into Turkey, the neighborhood has turned into the city’s “Little Syria.” Throughout the mostly working-class district – some 750 miles from Syria – there are now signs advertising “Syrian shwarma” and “Aleppo cuisine,” spelled out in Turkish and also in the curly, coiled letters of Arabic. Syrian street vendors selling cardamom-spiced coffee and jars of pickled vegetables crowd the sidewalks. 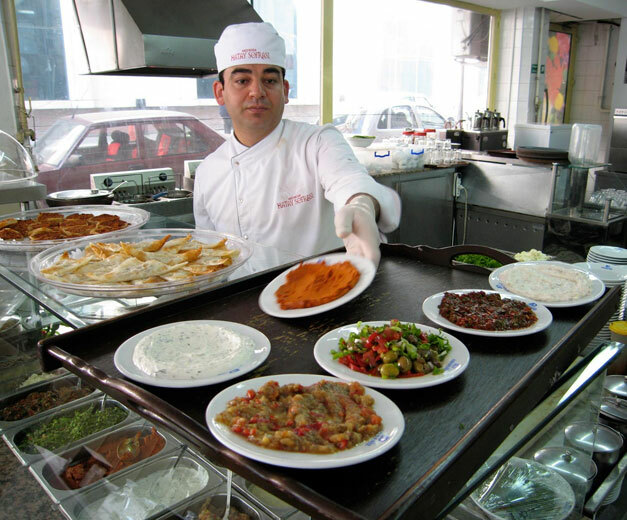 Restaurants serving displaced Syrians familiar dishes like fatteh, fried pieces of pita topped with slow-cooked chickpeas and doused in garlic-yogurt-tahini sauce, and muhammara, a spicy spread of roasted red pepper and walnut sweetened with a drizzle of pomegranate syrup, now dominate the main boulevard. filled with fluffy cheesy pancakes on his head. 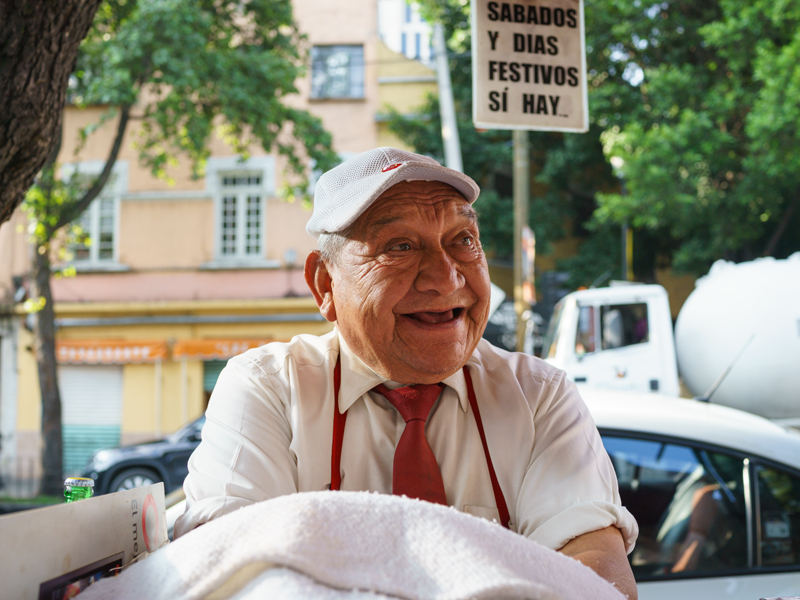 He’d holler, “Sweet cheese!”, and customers would flock to him. the country’s current ruler, Bashar al-Assad, only giving up on its Syrian home when the violence of the last few years became too much to bear. As Syria’s political and humanitarian crisis has forced millions to flee with few of their possessions – some clothes, peraps some photos – exiled Syrians have instead brought with them a different kind of currency: their culture, language and food. And at Salloura, that currency is gold. Syrians today scattered across the world remember the days when their biggest worry was making sure they placed an order for the shop’s famous fluffy, sweet cheese rolls in time for dinner. Hussam, a lone diner sitting outside Salloura, scoops up spoonfuls of safarjaliyya, an Aleppan lamb and quince stew, named after the Arabic word for the fruit. “It tastes like home,” the blonde, blue-eyed Aleppo native said with a sad smile. 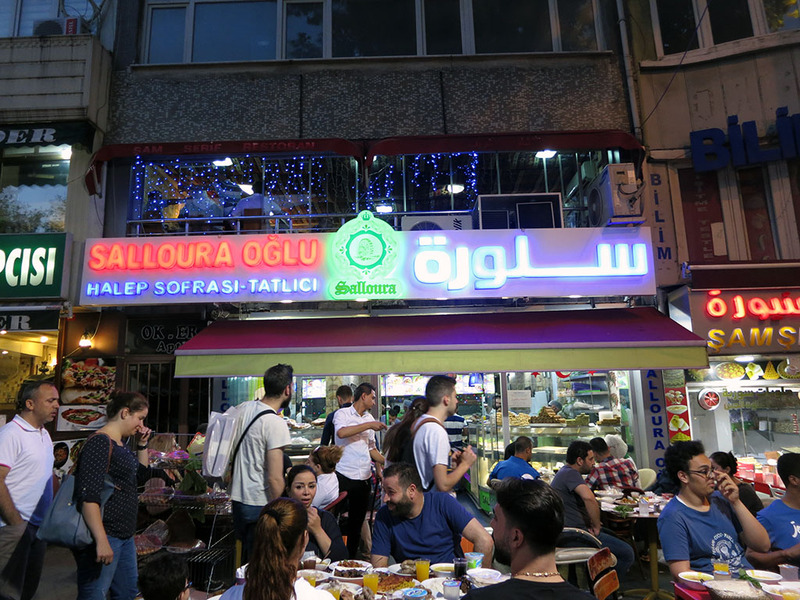 “As soon as I saw there was a Salloura in Istanbul I came right away…We used to always get dessert from them in Aleppo. But those simpler days have been replaced with Syria’s fractured and brutal conflict, and even dessert has become a victim of war. “It was a crisis: there was no gas, and sugar, flour and other items became extremely expensi ve,” Ahmed Sheikho, one of Salloura’s most trusted employees, recalled. They’d make do by baking desserts in a wood-burning oven, instead of the easier to manage gas oven they were used to working with. 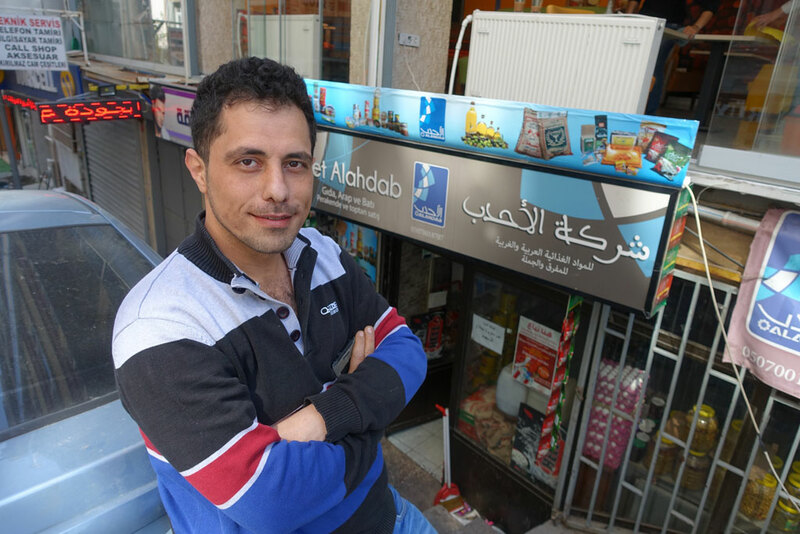 Ahmed, who came to Istanbul in late 2013, spent his last days in Aleppo managing the store after As’ad Salloura, his boss and the sweet shop’s portly patriarch, fled the war-ravaged city in the summer of 2012. Eventually it became too dangerous to keep sending people to work. “If something happened to [one of my employees] on his way to or from work, like if a sniper strikes him for example, I bear the responsibility,” said As’ad Salloura. “I could not bear this responsibility.” Over the course of late 2013 and 2014, As’ad paid to smuggle Ahmed, his wife and three kids and about 50 other Salloura employees to Istanbul, where he decided to open up shop. 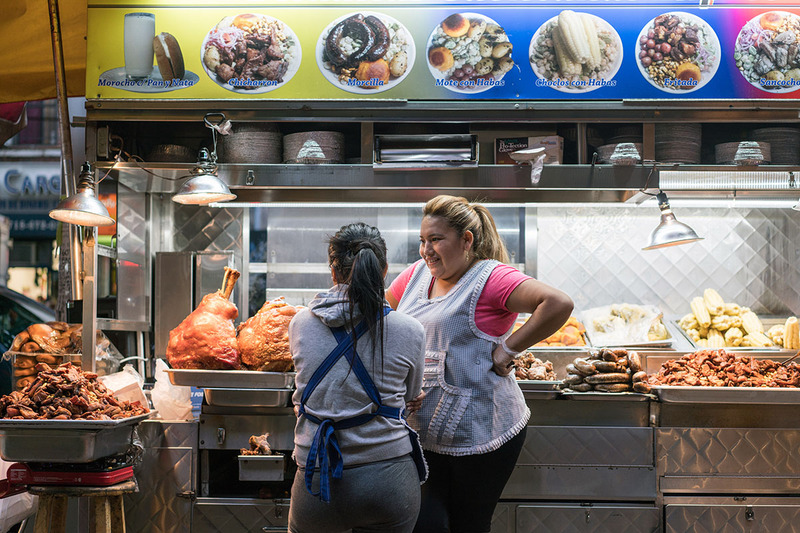 Within months of opening its doors in 2014, Salloura became a neighborhood sensation. Customers practically gush through its front doors, seeking their sugary fix. The sweet cream rolls are made of springy cheesy pancakes stuffed with sweet cream and cheese, rolled into what look like fluffy white cigars and drizzled in rosewater syrup with a crush of pistachios on top. We first met Rashed and Ahmed late last spring, during this period of Salloura’s growing popularity in Istanbul. By the summer, Salloura had added a factory where As’ad kept watch over the sweets production, and they opened several new shops in Istanbul in the fall. Each time we visited, they’d insist on stuffing us with hummus and stews, ice cream and cream rolls, transporting us to their homeland with each bite. And then, just like that, Ahmed and Rashed abruptly disappeared and suddenly reappeared – only now they were thousands of miles away, in Germany. A journey that already had countless dramatic twists and turns now had even more of them, reminding us that the story of Salloura is beyond a tale of a sweets shop in exile. It is the story of Syrians forced to move further and further from home. With each violent blow of their nation’s history they’re forced to rebuild in new places what they had before. Over the next few months we will be chronicling the evolving story of Salloura – the family and its enduring craft of sweets-making and the workers who carry on the family’s trade. Every two weeks we’ll publish a new installment of Salloura’s saga, following the shop and its people as they chase the memory of a time and place that no longer exists. 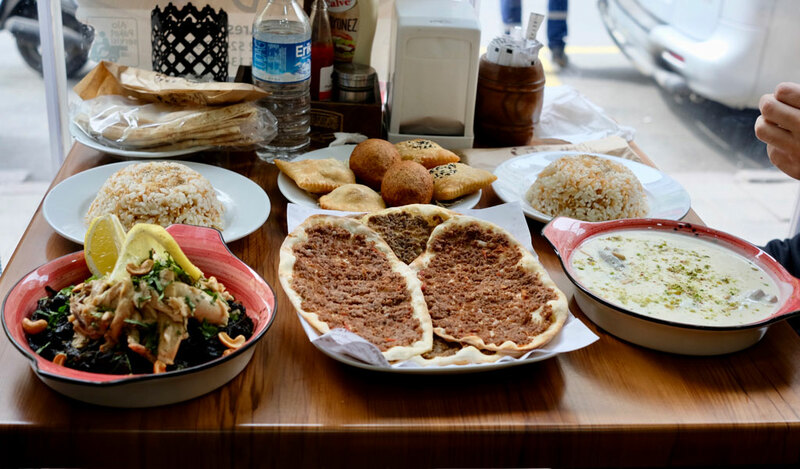 With each piece we’ll offer a key recipe to a dish described in or connected to the story, offering the chance to taste Syria right from your home. This piece was reported with support from The GroundTruth Project. Dalia Mortada was 2015 GroundTruth’s Middle East Fellow and Lauren Bohn is GroundTruth’s Middle East Correspondent. The next chapter in the series can be found here. 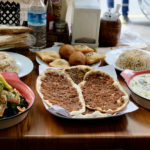 Saffarjaliyya, a tangy stew of quince, lamb and pomegranate juice is traditionally made with lamb chunks and kibbeh ground lamb and pine nuts stuffed in a shell of bulgur and ground beef and shaped into balls. But kibbeh is labor intensive and can be intimidating, so I’ve adapted the recipe to just include chunks of lamb shank. I also used some tips from other home cooks to add some tomato paste to give the dish a deeper color and flavor. For a traditional recipe that includes kibbeh, consult Anissa Helou’s cookbook Levant: Recipes and Memories from the Middle East. For one that includes tomato, here’s a great step-by step recipe on Orange Blossom Water, a food blog run by a Syrian home cook named Dimah. Quince sauce: Take the pomegranate seeds and pulverize them in the food processor. Strain and reserve the juice. In a medium sauce pan, put sugar and water over medium heat and add the chunks of quince, stirring to get them coated in the mixture. Cover and let simmer for 15 minutes. Add the pomegranate juice. Simmer for 30 to 45 minutes. The quince should be soft enough to be easily pierced with a fork, but not so soft that it’s falling apart. Lamb and broth: In a large pot, heat the ghee. Add the lamb and sprinkle with spice mixture and salt. Add the tomato paste, if using. Toss the lamb chunks until thoroughly coated in tomato paste and ghee and the outside is browned but don’t cook it all the way through. Add water until the lamb is just covered. Use a small tea strainer or sachet for the cardamom pods, cloves and peppercorns (it’ll make it easier to remove the spices from the broth later – otherwise, they’ll need to be scooped out with a slotted spoon or a strainer). Add spices, cinnamon stick and onions to the pot. Bring to a boil, turn the heat to low and allow to simmer for an hour. Assemble: If the lamb has a lot of broth, remove one or two cups and reserve for later use. You want the lamb chunks just barely covered in liquid. With the heat on low, add the quince sauce to the lamb and stir. Taste it – if it tastes really fruity, add back some of the broth. Do that in small quantities – about a quarter cup at a time – and keep tasting until there’s a balance of sweet, tangy and savory flavors. With a mortar and pestle – or even just with the back of a spoon – mash together the dried mint and garlic. Add to the pot. Let simmer about 10 to 15 minutes more. Serve hot in a soup bowl.